So much happening under our feet. Daily collapses of roadways due to the severe bow stretch, severe rains, crunching and land subduction all predicted in Zetatalk and all happening now. Last week in Utah a fatal road collapse killed a 14 year old girl and injured 2. It's painful to watch the planet crumble but we all knew it was coming. Buildings collapsing.........a daily happening too. With responses about what's causing all these happenings ranging from, rain, human error, poorly constructed, yada yada.....BUT, that's not going to fly with people much longer. As soon as Planet X peers out at us from the sky, people will remember all the things that have happened up to this point and finally somehow, they will connect the dots. Some will be in extreme denial, others will be so afraid and look for someone to take care of them, and still others will stand up and be counted and prepare as best we could. There's no wishing this away, there's only pushing forward to a better tomorrow. While our infrastructure crumbles around us we need to learn to be more careful, tread softly, kiss your kids, love with all your heart. We are IN IT NOW. I live in a house built in 1850 and it isn't falling down. Age does not mean collapse. A building in Malone that has been standing for more than a century will no longer be a sight in the town. The building on Route 11, well known to many in the community, collapsed overnight. While no one was injured, our Rachael Paradis tells us why the town is in a rush to tear it down. MALONE, N.Y. -- Neighbors in Malone stood in surprise, took pictures and even shared stories of a once popular tavern that started to crumble early Monday morning. County Legislator Billy Jones said, "It's an old structure, it was a structure that was obviously unsafe." The tavern/hotel was built in the early 1900'. It has been closed to the public for about 15 years and was condemned six months ago. Franklin County Emergency Services Director Rick Provost, "We're unsure what occurred last night at 3 a.m. What we do know is this building has been on our list of buildings with issues." Jones said, "Old things fall down." Police closed off part off Route 11 to traffic and to people, out of concern the rest of the building could fall down. Some in the community voiced concern over why this building, along with others like it in the area that haven't already been demolished. Officials say it comes down to money. Provost said, "The high cost of abatement for these buildings really makes it tough for the county or the village to take those burdens on." Jones, "We just have to come up with a plan to start taking some of these building down so we don't run into this problem going forward." The demolition is only expected to take hours, but cleaning up the area is a different issue. Officials say it could be weeks before the site is completely cleared. Temporary repairs to a section of Joy Street in Lake Elsinore are in place today after a 1-inch water line gave way, causing 80 feet of the roadway to collapse and the asphalt to buckle. The leak, caused by a 6 to 8-inch diameter tree root, was reported late Thursday in a line that leads to several duplexes on Joy between Machado Street and Riverside Drive, and behind Machado Elementary School. Water service was restored to the 34 customers early Friday morning, said Greg Morrison, spokesman for the Elsinore Valley Municipal Water District. Water district and contractor crews spent much of Friday removing the damaged asphalt on the southbound side of Joy and laying down a temporary patch. The road was opened in both directions by late afternoon. "That way the road will be open completely for the entire weekend," Morrison said. Crews will return Monday and trench from curb to curb to permanently repair the 1-inch line. On Tuesday, a paving company will remove the patch, put down new base and repave one side of Joy, Morrison said. Work on the other side will take place on Wednesday. County workers are testing for sinkholes but the work is proceeding methodically because of utility lines at the intersection, according to a Hillsborough County spokesman. Several lanes at the intersection of Windhorst Road and Parsons Avenue in Brandon remained closed for the indefinite future as county workers tread carefully in determining what caused a section of the roadway to collapse July 19. At the scene, late afternoon July 22, barricades were seen at the intersection, with drilling under way. Crew workers first believed a 16-inch sewage pipeline beneath the intersection might have caused the collapse of the 6-foot-square section of roadway on July 19, according to a county report. But the sewer line was dug up and found to be intact. Now the county is testing the intersection for sinkholes — but carefully, as Murray noted. Additional detours and lane closures are possible as crews dig up the line for inspection and any necessary repairs. Motorists who must travel through the intersection are warned to expect delays. At least one eastbound lane of Road near Etley Avenue and Cave Hill Cemetery will be closed during Thursday morning’s rush hour after a 48-inch brick sewer collapsed Wednesday evening. Crews noticed a depression in the road before discovering the sewer had collapsed, and the area will be excavated Thursday morning, said Metropolitan Sewer District Executive Bud Schardein. He said it was too early to tell what caused the collapse, but age was a likely factor. That part of the sewer was built in the 1880s and could have been weakened from an unusually wet spring. “With all the wet weather we’ve had this past spring, that has a tendency to undermine the mortar,” Schardein said. CARBON COUNTY (wpr) - Engineers say a large section of Wyoming highway where four Colorado family members plunged to their deaths might have totally collapsed in a matter of minutes. It had been raining for hours Monday night when local authorities warned the Constantinides family, among others, about potential flood conditions near North Brush Creek Campground around midnight. 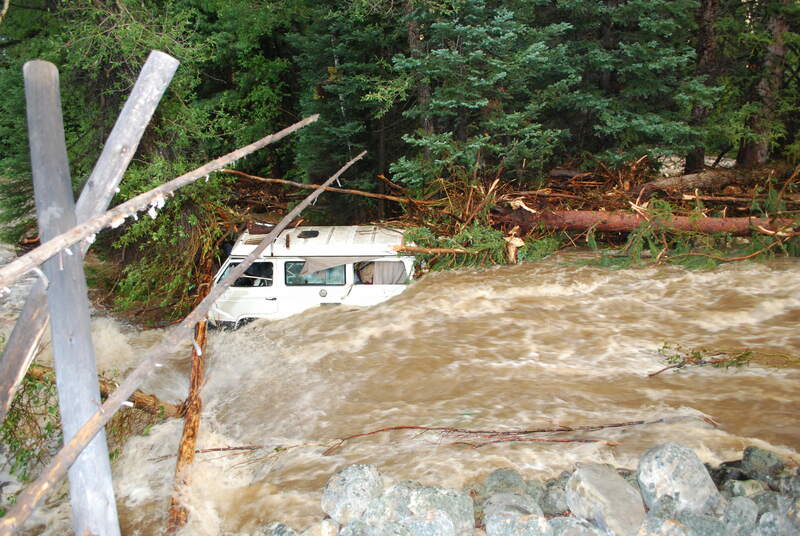 Not long afterward, the family's van drove into a washed-out portion of Wyoming highway 130 and was swept about 75 yards down Brush Creek. Laurel Constantindies and her three daughters died. The husband and father, Alex Constantindies, who had grown up in Laramie, survived and escape the vehicle. He and a passerby later rescued Carbon County Emergency management Coordinator John Ziegler, whose car washed out while he was trying to assist in flood protection efforts. Ziegler said he was "very fortunate" to have survived. Bruce Burrows of the Wyoming Transportation Department says engineers are studying what happened to the roadway early Tuesday morning. He says preliminary assessments indicate the creek swollen with rain and snowmelt may have undermined the roadway over some hours and then gouged a 25-foot-wide, 9-foot-deep hole in a matter of minutes. Recently, Yunnan Province, Internet users post, said the new Xinping county secondary road test three estuary opening day collapse occurs, resulting in 2 dead 2 injured. Internet users have questioned this “the most short-lived highway” Why just fix it collapsed, was “too much rain” or “bad way”? recently, Internet users “pass,” said Post, June 27, Xinping County of Yuxi City, three city secondary road test the opening of the estuary collapse occurred the next day, resulting in a vehicle passing through here turn under the cliff, killing two people died inside the car and two others injured, highway interrupted. For the cause of the accident, the local government is a single point of heavy rain caused by a natural disaster. 7 8, correspondent along the new road to the scene three, the road there are construction workers on the highway guardrail, drainage and other construction, from time to time some sections of earth and rock rolled down from the hills. close to the scene of the accident, the construction set up roadblocks on the road side. In the new three road K25 +450 to K26 +480 road, the reporter saw a total of three road damage, including two collapsed, a surface crack. Road accident at the hillside, two-way four-lane have collapsed, a lot of rocks, soil and concrete was rushed into the street of the valley. Zhang Xinping County Department of Transportation Secretary BU has introduced three new roads through villages and towns in Xinping County 8 19 village committees, with a total mileage of 90 kilometers . Road along the fragile geology, disasters, floods and geological disasters have been more serious. accidents mainly due to heavy rains led to a single point of soft roadbed, road ditches and culverts to be above the blockage, and finally the formation of water as a waterfall of impact, resulting in collapse of highway roadbed. Bu there are rules that highway design, construction and supervision units are selected strictly in accordance with the bidding system, procedural compliance and found no serious design flaws, quality of construction or supervision of omissions. collapse occurred Sections of the construction unit project manager Jiangzu Long introduction, the unit will subcontract work to the successful construction services company, the project head of engineering equipment and materials, and is responsible for management and technical guidance, service company only the labor force, which is not labor sub-subcontract, the state permitted by law. he said, in strict accordance with design drawings for construction, engineering, quality is no problem, Lu Jisong soft infiltration and erosion is mainly caused by the floods. afterwards, Yunnan Provincial Department and the Transportation Department were sent experts to the scene. The Group believes that: section of the incident transverse slope steep terrain, poor geological conditions, heavy rainfall increased the hydrostatic pressure, the formation of collapse, is a heavy rainfall-induced natural disasters. Yunnan Provincial Communications Department who participated in the survey, experts say, from the survey of the situation, roadbed, retaining wall strength and so meet the requirements and found no quality problems. Reporter learned that the investigation, three new road opened in October 2009 to build, and design in May 2010 before the Provincial Communications Department has been approved, there is “not approved prior to construction” and “time duration” issue. Not hand over the road in case of acceptance of test traffic violations, and plans to be held on 30 June the opening ceremony, canceled after the accident. construction personnel, three new road along the geological environment is complex, time is short, heavy task in building a post, Xinping shouted “make a big quick-drying 60 days,” the slogan of the progress of the projects Forced , post workers overtime work. what makes engineering so catch it? Reporters learned that, in addition to travel to meet the requirements of the masses, more important reason is that for national road toll for the abolition of two grants. According to the policy, the new secondary roads shall be June 30 this year, opened to traffic, or can not enjoy the state’s two highway toll abolition of subsidies. Broadcaster News24 cited KwaZulu-Natal emergency medical services spokesman Robert McKenzie as saying heavy rain may have been to blame for the collapse on Thursday night in Dlangubo. The report said the collapse at the Pentecostal church occurred as an Easter season service was underway. Mr McKenzie said six people were seriously injured. TWO buildings have collapsed in Rio de Janeiro killing two and leaving 15 missing, according to reports. Services have rushed to the scene and are scouring the rubble. Witnesses say the buildings "suddenly crumbled", reports Globo.com. One resident said: "The locals who are helping went there and heard a lady scream exactly in her room." The homes have between three and four floors. One man was seen being taken away on a stretcher after the collapse at around 7am local time, or 11am GMT. The region had been hit by thunderstorms earlier this week, although the cause is not yet clear. It was not raining at the time of the collapse. According to reports, there is a strong smell of gas. Firefighters have put the area on alert over fears buildings nearby may also be at risk. According to reports there are around 60 buildings under construction in the area. One witness added: "They build without end, without stopping. "One building after another, crazy. It was constant explosions. They just want to build and sell." RIO DE JANEIRO, April 12 (Reuters) - At least two people died and two more were injured when two unlicensed buildings in a militia-controlled outer borough of Rio de Janeiro collapsed on Friday, just days after deadly rains caused chaos in Brazil’s second largest city. Powerful militias - originally created to defend inhabitants from drug gangs, but which now act as fearsome local crime outfits - have a strong presence in the neighborhood where the buildings collapsed. Militias often control gas and electricity services, but now make huge profits by stealing land and illegally selling it for construction projects. Drivers who are traveling between the Bandon area and Coquille will need to use U.S. 101 and OR 42 to get around the closure. Deaths caused by the collapse of a balcony at a housewarming party rose to three on Sunday, while nine people injured in Saturday’s incident in Sdoeung Chey commune’s Khna village in Kampong Cham province’s Cheung Prey district remained hospitalised. The house owner and host of the party was identified as Srun Bros, deputy district police chief Yem Sophal told The Post on Sunday. The victim who passed away immediately was identified as Nhil Pok, a 70-year-old woman from Khna village, while the two who died in hospital had yet to be identified. “Bros built his own house as he is a house builder. He spent nearly two months building it at a cost of more than $10,000. I do not know what techniques he used on his house, but he has built others for people and there have been no problems with those." “I do not know yet who is to take responsibility and pay compensation. The house owner is deeply saddened and we are further investigating,” he said. Neither Prak Sarom, Sdoeung Chey commune chief, nor Lanh Leang, the commune’s police chief, nor Bros were available for comment on Sunday. A Cheung Prey district police report said the balcony collapse occurred at 9:45am on Sunday. A 7mx12m wooden building and a metre-and-a-half area of concrete in front of the house were damaged in the incident, as was a tuk-tuk, a motorbike and a bicycle. A three-story building collapsed on a primary school in Lagos, Nigeria shortly after the day’s classes had begun, sparking fears that many children were killed or are trapped beneath the rubble. The collapse happened at roughly 10am local time on Wednesday. Initial reports indicate that at least 10 children have been pulled from the rubble so far as rescue workers scramble to save lives. Many more are feared dead. Hundreds of concerned residents flooded the area in the immediate aftermath of the collapse as rescue workers began removing rubble. "It is believed that many people including children are currently trapped in the building," Ibrahim Farinloye, spokesman for the National Emergency Management Agency, said as cited by Reuters. MISSOULA, Mont. — Part of the roof at a Montana State University fitness center in Bozeman collapsed early Thursday morning. The collapse occurred at the Marga Hosaeus Fitness Center used by students. The Bozeman Fire Department says firefighters were called around 2:20 a.m. and found a partial roof collapse on the backside of an unoccupied building. There was no fire, but broken heating pipes were releasing steam. "It was an unexpected situation," said MSU spokesman Michael Becker. "We are immensely grateful that, if it was going to happen, it happened when it did, when the building was barely occupied." One maintenance worker told NBC Montana he was on the roof a few days ago, and the snow was up to his waist. Becker added that it's too early to say what the cause is. "We have to wait for the assessments from the engineers to come back to find out what exactly what the status is for the rest of the building before we can even begin looking at reopening," Becker added. The school notified students via email and text. "Actually, it's a lot worse that I thought it was going be," said sophomore James Olechowski. "I was like, 'Well, might as well check it out, since I'm not getting any gym in today.'" "I was very upset," said student Sabine Byrne. "This is where we usually come and now -- can't work out here anymore." Students are being asked to avoid the area until further notice from MSU. The school is making arrangements for those who had classes at the fitness center. Brick Breeden Field House is only accessible through the south entrance at this time. There were no injuries and the fitness center has been closed. The cause of the collapse is under investigation. WOLFE COUNTY, Ky. (WKYT/WYMT) - A State of Emergency was declared in Wolfe County after heavy rains moved into the region Saturday night. Our sister station, WKYT , reports many roads were flooded and Shooting Fork partially collapsed. "The water collapsed the culverts and just washed the whole road out," Wolfe County EMS Director Marcus Stephens told WKYT. No cars were on the road during the collapse. Thirteen people were unable to leave their homes due to the road collapse. Stephens told WKYT that crews were building a temporary bridge. If you have any flood damage, officials ask that you give them a call. Officials said those who are eligible will receive a clean-up kit and that funding would be determined by the extent of the damage. Dust-covered students have been filmed stumbling through rubble still in shock after a Russian university building has collapsed trapping an estimated 21 people. 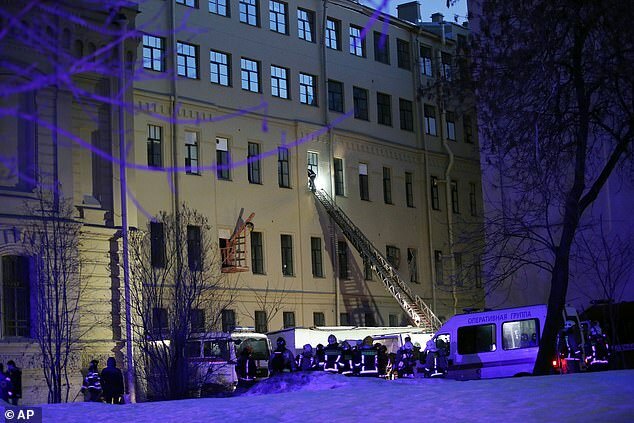 Security services said more than 80 people have been evacuated after the fifth and sixth floors of the National Research University of Information Technologies, Mechanics and Optics in St. Petersburg collapsed earlier today. Students were filmed clambering over ruins inside the smoke-filled building and could be heard coughing as they inhaled the dust. One source claimed 150 square metres of the building have collapsed, but the cause is not yet clear. News reports said there may have been students in the building for elective weekend instruction. According to Russian agencies that several people were trapped under debris in the building but there was no immediate information on casualties. The roof and several floors of the building collapsed during renovation work. TASS news agency said that acting St Petersburg governor Alexander Beglov had gone to the scene. Student Fedor Gusak was on the top floor and said: 'The whole building trembled, shaking, and I thought that everything was falling apart. 'The electricity went off. 'It was very scary at this moment. I opened the door to the corridor to see what had happened. 'There was unreal dust, I saw a hole in the roof and no stairs to go down. No exit. While we were thinking what to do, people shouted 'Is there anyone alive?'. A building collapsed in an industrial area in the Cangshan District in Fuzhou, capital of southeast China's Fujian Province, at 5:50 a.m. BJT on Saturday (2150 GMT, Friday). One person has died of injuries following Saturday's building collapse. The deceased was one of the 15 people who were rescued and hospitalized as of this afternoon, six of whom have been discharged from the hospital. According to firefighters, the five-story structure was self-built in 2003. Following the incident, people living near the site have been evacuated and a district-wide safety inspection has been carried out on self-built houses and dilapidated houses. 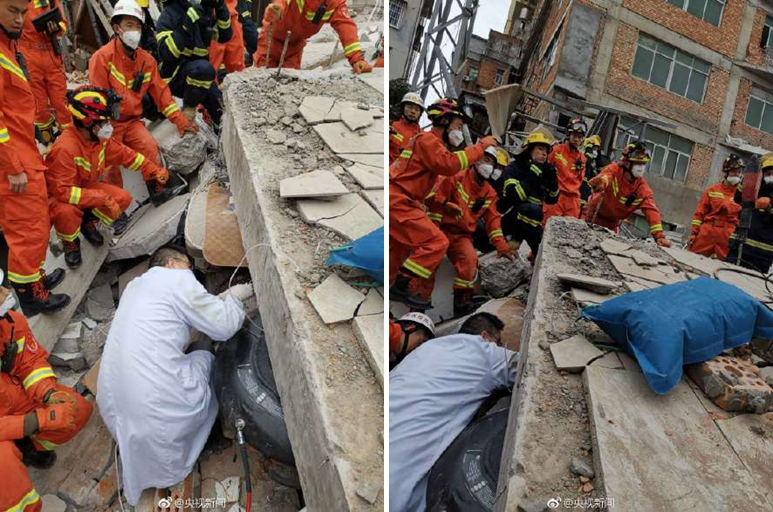 A total of 17 people were found trapped by rescuers as of 2:00 p.m. and 15 of them were pulled out and sent to the hospital, according to Fuzhou authorities. The authorities confirmed one person sustained serious injury. The cause behind the incident remains unclear, and teams of medics, police and emergency staff are working at the scene for any survivors. 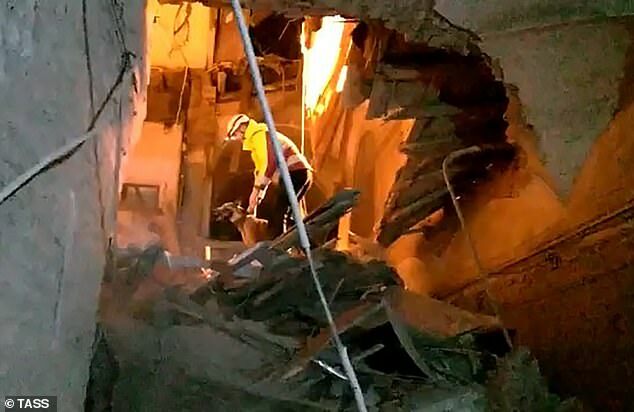 Fourteen people who were trapped under the rubble have been rescued and hospitalized, including one person with serious injuries. The owner of the building has also been detained by the police. A preliminary investigation confirmed that seven out the 10 trapped have been rescued and sent for medical treatment. At least seven people were trapped under the rubble after the collapse. Two of the trapped people have been rescued, according to local authorities. 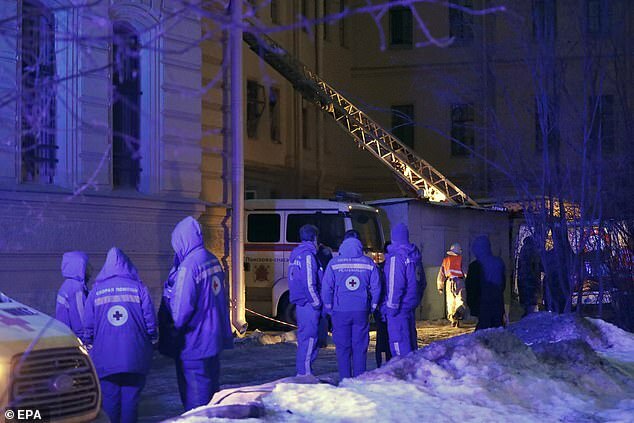 A university building has partially collapsed in the city of St. Petersburg. 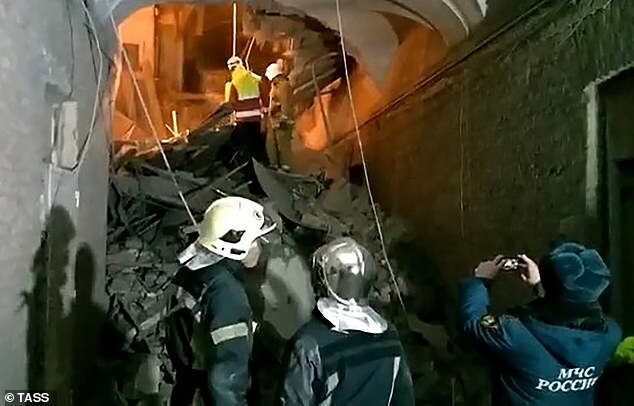 It is feared that a number of people may be trapped under the rubble, Russian media reports, citing eyewitnesses.